XPEDITE® is an innovative pre-workout drink mix designed to energize your mind and body for more powerful and effective workouts. It was formulated by renowned sports nutritionist Victor Conte to improve physical strength and stamina, increase alertness, elevate mood, and enhance your overall sense of well-being. This energy supplement is not only used for high-intensity athletic activity, but also to ignite an energy boost as needed for other daily activities. If you're looking for a great workout supplement to provide a smooth but powerful source of energy that also includes an extensive list of effective performance enhancers, then XPEDITE is for you! It's time to XPEDITE your fitness and performance goals! 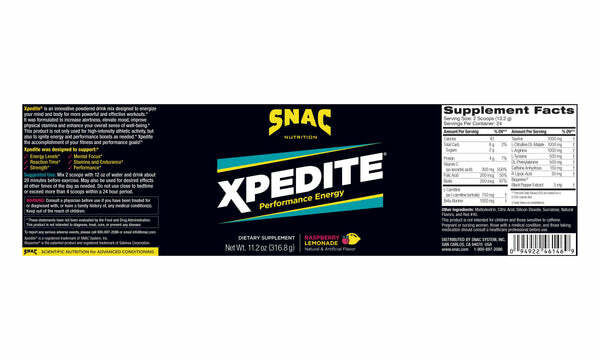 XPEDITE contains a potent ingredient called R-Lipoic Acid or R-LA, which is not included in the lion’s share of preworkout/energy products available. Some researchers believe R-LA may eventually be acknowledged as one of the most important nutraceutical compounds on the market for cellular energy production. Likewise, this scientific formula contains biotin, taurine and L-carnitine, which further support the optimal blood sugar levels needed during high-intensity exercise. As a bonus, these ingredients support fat loss by increasing glucose uptake by muscle tissue, which helps to prevent fat cell deposition. XPEDITE also contains the amino acid tyrosine, which is a precursor of the brain neurotransmitters that transmit nerve impulses. U.S. soldiers undergoing various psychological and physiological stress tests were given tyrosine to measure its effects on performance. The researchers found that they were more efficient, alert and had faster reaction times. In addition, XPEDITE contains phenylalanine which may help to elevate mood and enhance concentration. XPEDITE also includes citrulline malate which may boost athletic performance and recovery by accelerating the elimination of the toxic byproducts of protein metabolism and the removal of ammonia and lactate from the blood. The thermogenic absorption enhancer Bioperine® has been added to increase the overall potency and effectiveness. Finally, beta-alanine is a precursor of carnosine, which regulates important aspects of cell metabolism that may provide stamina and energy-enhancement benefits. Amazing energy boost and in ready to go packs. No measuring needed! My favorite preworkout now comes in single servings?! You guys don't want to miss out on these. I know it seems like you won't need these but trust me, you do. You don't think about it until you're on the way to the gym and realize you forgot to take your preworkout. I keep these in my gym bag at all times. I know I always have preworkout in case I forget to take it beforehand and it doesn't weigh my gym bag down. The preworkout itself is my absolute favorite!!! It tastes great, gives me that extra boost I need without any crash and doesn't make me jittery. I love the pump it gives as well. The only negative thing about this product is you will need to buy extra because your gym friends will keep asking you if you have them!! !